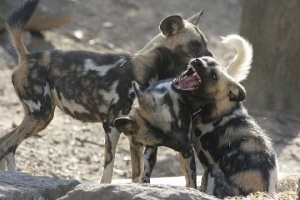 Home / News / Latest News of Packs and Pups direct from Painted Dog Conservation, Hwange National Park, Zimbabwe. Latest News of Packs and Pups direct from Painted Dog Conservation, Hwange National Park, Zimbabwe. Life on the front line of conservation has many ups and downs, and this year has been no exception for the Painted Dog Conservation in Hwange National Park. “The Kutanga pack is again in turmoil following the death of Shoulder Spot and the alpha male, BT, leaving only MK and Surf. But a ray of hope emerged recently when a new female, named Kerin, bonded with Surf, breathing new life into what we still refer to as the Kutanga pack”. This year, four packs in the Hwange Main Camp area had pups which is the highest number the PDC has recorded in a long time and is seen as a ” glimmer of hope”. 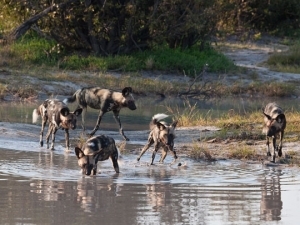 The Nyamandhlovu pack had ten pups, bringing the pack total up to 15. Currently, however, only seven pups survive with the five adults. One of the pups almost drowned in a concrete water trough but was fortunately rescued by a park scout. As Peter writes, this is “Surely an example, if ever there was one, that anything can and does happen to the pups and that the fate of the lost three is for speculation . Jealous (Mpofu, PDC Senior Tracker), saw the pack only yesterday and they are very fit and healthy”. Optimism for the pups survival remains high as the calving season begins soon and will provide the adult dogs with a relatively easy and abundant source of prey to feed the hungry pups. Jealous is reported to be busy and has recently tracked down the Broken Rifle pack, sighted first at the Broken Rifle water hole during September and then again at Ngweshla water hole. This pack of seven adults and four pups is new to PDC and is said to be, “a real pleasure to watch”. The elusive Kanondo pack spends most of its time in the Gwayi Conservancy to the East of Hwange National Park and, as a result, is rarely seen. A recent sighting has confirmed that the pack consists of four adults and five pups. One of the ongoing problems in Hwange is that, on average, pack sizes are still small and so pup survival is not great. The simple equation is that the more adults in the pack, the more pups survive. Evidence of this can be seen in Mana Pools, where packs of 20+ exist. For now in Hwange, PDC, “cling(s) to any positive news, no matter how small, and for now we are celebrating seeing more dogs in and around Hwange Main Camp”, reports Peter Blinston. Dr Greg Rasmussen, Founder and Research Director of PDC, has spent time this year in the Sinamatella / Robins region, to the west of Hwange, where he has reported sightings of seven packs. He estimates the Hwange National Park population to be 30 packs numbering approximately 120 dogs. This is fewer than would be expected or hoped for in a National Park that is almost 15,000 square kilometres (5,700 square miles) in size. You can follow the work of the PDC and be one of the small party joining Steve Leonard Patron of PDC and Wildlife Vets International in Zimbabwe, on a special one-off African Wild Dog Conservation Safari in June 2014. This will be an awesome and all encompassing wild dog experience, spending time with Greg, Peter and Jealous and culminates with Steve starting the vital vaccination programme. It is a joint-venture conservation safari so in participating you are actively financially supporting the work PDC does in helping the survival of this endangered species. This is a pioneering Zimbabwe safari that is leading eco-tourism in Africa to more meaningful level.